Pulp for papermaking was produced by macerating mulberry bark as early as the 2nd century in Han dynasty China, where the invention of paper is traditionally attributed to Cai Lun. Lu Ji, in his 3rd century commentary on the Classic of Poetry, mentions that people residing south of the Yangtze River would traditionally pound mulberry bark to make paper or clothing. By the 6th century, the mulberry tree was domesticated by farmers in China specifically for the purpose of producing pulp to be used in the papermaking process. In addition to mulberry, pulp was also made from bamboo, hibiscus bark, blue sandalwood, straw, and cotton. Papermaking using pulp made from hemp and linen fibers from tattered clothing, fishing nets and fabric bags spread to Europe in the 13th century, with an ever-increasing use of rags being central to the manufacture and affordability of rag paper, a factor in the development of printing. By the 1800s, demand often exceeding the available supply of rags, and also the manual labor of papermaking resulted in paper being still a relatively pricey product. Using wood pulp to make paper is a fairly recent innovation, that was almost concurrent to the invention of automatic papermaking machines, both together resulting in paper and cardboard becoming an inexpensive commodity in modern times. Although the first use of paper made from wood pulp dates from 1800, as seen in some pages of a book published by Matthias Koops that year in London, large-scale wood paper production began with the development of mechanical pulping in Germany by Friedrich Gottlob Keller in the 1840s, and by the Canadian inventor Charles Fenerty in Nova Scotia, Chemical processes quickly followed, first with J. Roth's use of sulfurous acid to treat wood, then by Benjamin Tilghman's U.S. patent on the use of calcium bisulfite, Ca(HSO3)2, to pulp wood in 1867. Almost a decade later, the first commercial sulfite pulp mill was built, in Sweden. It used magnesium as the counter ion and was based on work by Carl Daniel Ekman. By 1900, sulfite pulping had become the dominant means of producing wood pulp, surpassing mechanical pulping methods. The competing chemical pulping process, the sulfate, or kraft, process, was developed by Carl F. Dahl in 1879; the first kraft mill started, in Sweden, in 1890. The invention of the recovery boiler, by G.H. Tomlinson in the early 1930s, allowed kraft mills to recycle almost all of their pulping chemicals. This, along with the ability of the kraft process to accept a wider variety of types of wood and to produce stronger fibres, made the kraft process the dominant pulping process, starting in the 1940s. Global production of wood pulp in 2006 was 175 million tons (160 million tonnes). In the previous year, 63 million tons (57 million tonnes) of market pulp (not made into paper in the same facility) was sold, with Canada being the largest source at 21 percent of the total, followed by the United States at 16 percent. The wood fiber sources required for pulping are "45% sawmill residue, 21% logs and chips, and 34% recycled paper" (Canada, 2014). Chemical pulp made up 93 percent of market pulp. The timber resources used to make wood pulp are referred to as pulpwood. While in theory, any tree can be used for pulp-making, coniferous trees are preferred because the cellulose fibers in the pulp of these species are longer, and therefore make stronger paper. Some of the most commonly used softwood trees for paper making include spruce, pine, fir, larch and hemlock, and hardwoods such as eucalyptus, aspen and birch. There is also increasing interest in genetically modified tree species (such as GM eucalyptus and GM poplar), because of several major benefits these can provide, such as increased ease of breaking down lignin and increased growth rate. Most pulp mills use good forest management practices in harvesting trees to ensure that they have a sustainable source of raw materials. One of the major complaints about harvesting wood for pulp mills is that it reduces the biodiversity of the harvested forest. Pulp tree plantations account for 16 percent of world pulp production, old-growth forests 9 percent, and second- and third- and more generation forests account for the rest. Reforestation is practiced in most areas, so trees are a renewable resource. The FSC (Forest Stewardship Council), SFI (Sustainable Forestry Initiative), PEFC (Programme for the Endorsement of Forest Certification), and other bodies certify paper made from trees harvested according to guidelines meant to ensure good forestry practices. The number of trees consumed depends on whether mechanical processes or chemical processes are used. It has been estimated that based on a mixture of softwoods and hardwoods 12 metres (40 ft) tall and 15–20 centimetres (6–8 in) in diameter, it would take an average of 24 trees to produce 0.9 tonne (1 ton) of printing and writing paper, using the kraft process (chemical pulping). Mechanical pulping is about twice as efficient in using trees, since almost all of the wood is used to make fibre, therefore it takes about 12 trees to make 0.9 tonne (1 ton) of mechanical pulp or newsprint. There are roughly two short tons in a cord of wood. Thermomechanical pulp is pulp produced by processing wood chips using heat (thus "thermo-") and a mechanical refining movement (thus "-mechanical"). It is a two-stage process where the logs are first stripped of their bark and converted into small chips. These chips have a moisture content of around 25–30 percent. A mechanical force is applied to the wood chips in a crushing or grinding action which generates heat and water vapour and softens the lignin thus separating the individual fibres. The pulp is then screened and cleaned, any clumps of fibre are reprocessed. This process gives a high yield of fibre from the timber (around 95 percent) and as the lignin has not been removed, the fibres are hard and rigid. Wood chips can be pre-treated with sodium carbonate, sodium hydroxide, sodium sulfate and other chemicals prior to refining with equipment similar to a mechanical mill. The conditions of the chemical treatment are much less vigorous (lower temperature, shorter time, less extreme pH) than in a chemical pulping process since the goal is to make the fibers easier to refine, not to remove lignin as in a fully chemical process. Pulps made using these hybrid processes are known as chemi-thermomechanical pulps (CTMP). Chemical pulp is produced by combining wood chips and chemicals in large vessels called digesters. There, heat and chemicals break down lignin, which binds cellulose fibres together, without seriously degrading the cellulose fibres. Chemical pulp is used for materials that need to be stronger or combined with mechanical pulps to give a product different characteristics. The kraft process is the dominant chemical pulping method, with the sulfite process second. 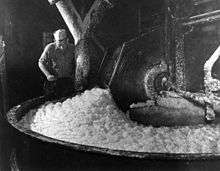 Historically soda pulping was the first successful chemical pulping method. Ancient Sanskrit on Hemp based Paper. Hemp Fiber was commonly used in the production of paper from 200 BC to the late 1800s. Non-wood pulp made from rags, or from linters (short fibers discarded by the textile industry), is still manufactured today mostly as a pricey product perceived as being of better quality, especially for the art market and so-called "archival" paper. The modern source fiber is most often cotton, with a much higher value given to paper made from linen, hemp, abaca, kōzo or other fibers. 100% cotton, or a combination of cotton and linen pulp is used for certificates, currency, and passports. Abaca pulp has very long, strong fibers, and is used for teabags. There is enough straw to meet much of North America's book, magazine, catalogue and copy paper needs. Agricultural-based paper does not come from tree farms. Some agricultural residue pulps take less time to cook than wood pulps. That means agricultural-based paper uses less energy, less water and fewer chemicals. Pulp made from wheat and flax straw has half the ecological footprint of pulp made from forests. Hemp paper is a possible replacement, but processing infrastructure, storage costs and the low usability percentage of the plant means it is not a ready substitute. However, wood is also a renewable resource, with about 90 percent of pulp coming from plantations or reforested areas. Non-wood fibre sources account for about 5–10 percent of global pulp production, for a variety of reasons, including seasonal availability, problems with chemical recovery, brightness of the pulp etc. In China, as of 2009, a higher proportion of non-wood pulp processing increased use of water and energy. Market pulp is any variety of pulp that is produced in one location, dried and shipped to another location for further processing. Important quality parameters for pulp not directly related to the fibres are brightness, dirt levels, viscosity and ash content. 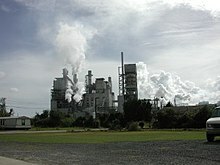 In 2004 it accounted for about 55 million metric tons of market pulp. The kraft pulping reaction in particular releases foul-smelling compounds. The hydrogen sulfide reagent that degrades lignin structure also causes some demethylation to produce methanethiol, dimethyl sulfide and dimethyl disulfide. These same compounds are released during many forms of microbial decay, including the internal microbial action in Camembert cheese, although the kraft process is a chemical one and does not involve any microbial degradation. These compounds have extremely low odor thresholds and disagreeable smells. ^ a b c d Hunter, Dard (1943). Papermaking, the history and technique of an ancient craft. Dover. ^ a b Sjöström, E. (1993). Wood Chemistry: Fundamentals and Applications. Academic Press. ^ "Pulp production growing in new areas (Global production)". Metso Corporation. September 5, 2006. Archived from the original on October 23, 2007. Retrieved 2007-10-13. ^ Sixta, Herbert (2006). "Preface". Handbook of Pulp. 1. Wiley-VCH Verlag & Co KGaA. p. XXIII. ISBN 3-527-30999-3. ^ a b "Overview of the Wood Pulp Industry". Market Pulp Association. 2007. Archived from the original on 2007-10-16. Retrieved 2007-10-13. ^ Manthy, Robert S.; James, Lee Morton; Huber, Henry H. (1973). Michigan Timber Production: Now and in 1985. Michigan State University, Agricultural Experiment Station and Cooperative Extension service. ^ Geman, Helyette (2014-12-29). Agricultural Finance: From Crops to Land, Water and Infrastructure. John Wiley & Sons. ISBN 9781118827376. ^ Sixta, Herbert, ed. (2006). Handbook of pulp. 1. Winheim, Germany: Wiley-VCH. p. 9. ISBN 3-527-30997-7. ^ "Certification Tracking products from the forest to the shelf". Archived from the original on 2007-08-26. Retrieved 2007-09-21. ^ Trees Into Paper. Conservatree. Retrieved on 2017-01-09. ^ ""dead link"". Archived from the original on 2008-12-25. Retrieved 2009-02-05. ^ a b Iggesund Paperboard AB (2008). "Paperboard the Iggesund Way": 15. ^ Avella, Maurizio; Bozzi, Claudio; Dell'Erba, Ramiro; Focher, Bonaventura; Marzetti, Annamaria; Martuscelli, Ezio (November 1995). "Steam-exploded wheat straw fibres as reinforcing material for polypropylene-based composites. Characterization and properties". Angewandte Makromolekulare Chemie. 233 (1): 149–166. doi:10.1002/apmc.1995.052330113. ^ "How Money is Made - Paper and Ink". BUREAU OF ENGRAVING AND PRINTING U.S. Department of the Treasury. Retrieved July 14, 2017. ^ "Canopy's Straw Paper Campaign". canopyplanet.org. Archived from the original on 2013-09-03. ^ 造纸企业能入“绿色之门”的前提 南粤大地 南方网. News.southcn.com (2009-07-20). Retrieved on 2017-01-09. ^ Stenius, Per (2000). "1". PForest Products Chemistry. Papermaking Science and Technology. 3. Finland: Fapet Oy. p. 29. ISBN 952-5216-03-9. ^ a b c d e Nanko, Hirko; Button, Allan; Hillman, Dave (2005). The World of Market Pulp. Appleton, Wisconsin, USA: WOMP, LLC. pp. 2–3. ISBN 0-615-13013-5. ^ Lefebrvre, Paul (February 4, 2009). Wood products market looks soft. The Chronicle. This page was last edited on 16 February 2019, at 19:22 (UTC).